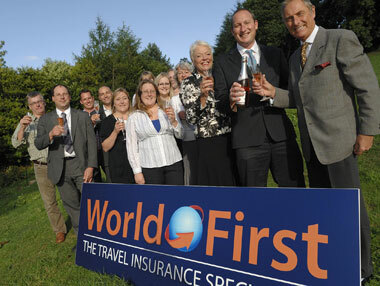 Honiton based Travel Insurance specialist, World First Travel Insurance, is celebrating the appointment of four new members of staff, after seeing more than 400% growth in the business during the past 12 months. Despite one of the most difficult starts to the year due to volcanic ash, cabin crew strikes and the collapse of tour operators, World First is reporting record growth. Rothwell & Towler, parent company of World First, an independent travel insurance specialist, was established in 1973. The company, now managed by son of the founder, Martin Rothwell, has been making effective use of online technology and new media to help the business grow over the past two years. The online strategy has seen World First increase its visibility on Google, resulting in visitor numbers to the website, www.world-first.co.uk doubling in the past 12 months. They also use social media platforms, including twitter, facebook and blogs to engage with customers. The company has also been mentioned a number of times in national newspapers, being cited as “The savior for people over the age of 65 who can’t find travel insurance” by Gill Charlton of the Daily Telegraph. In addition to the in house appointments, the overall business strategy is underpinned by an ‘in-house agency’ that has been developed by Martin Rothwell. This is a team of independent professionals including marketing, web development, training, research consultants, and specialists in Search Engine Optimisation and PR, who regularly attend board meetings. Commenting on the business boom, Managing Partner Martin Rothwell said: “We are experiencing our best year yet at World First. It would seem that all of the travel chaos and disruption earlier this year has convinced people that they need to have good travel insurance, just in case something goes wrong. “People have a choice when it comes to travel insurance, they can choose not to take it out and risk losing money if something goes wrong, they can go for a ‘one size fits all’ policy from their travel agent or as part of their bank account or they can choose travel insurance tailored to their specific needs and holiday. This is where we fit in, offering our customers policies designed to suit them and their holidays, as well as peace of mind when it comes to their travel plans. The company has ambitious growth plans and intends to double the size of the business in the next 12 months. World First currently operate throughout the UK and have plans to launch products for travellers in 34 other countries within the next month. The new appointments and company structure has been designed to help the business continue its growth and further secure their position as ‘the’ travel insurance specialist in the marketplace, a market that is estimated to be worth £700m in the UK. A significant development for World First in the last 12 months has been an online medical screening system, enabling clients to provide details of their medical conditions, find a policy that suits them and be covered instantly once the online policy is activated. They also introduced an extension in age limits to cover travellers aged up to 100. World First offers single and multi trip polices for worldwide travel and caters for groups, individuals, families, people with pre-existing medical conditions and older travellers. Single trip travel insurance policies are priced from £7* and annual cover from £18*. Visit us at World First travel insurance for more details. *This is not a definitive price. Actual price is based on individuals’ circumstances and eligibility for cover.